Black Violin has appeared with Alicia Keys at the Billboard Awards, won Showtime at the Apollo, and performed for second inauguration of President Obama. Now they’ve won the respect of Grand Rapids. 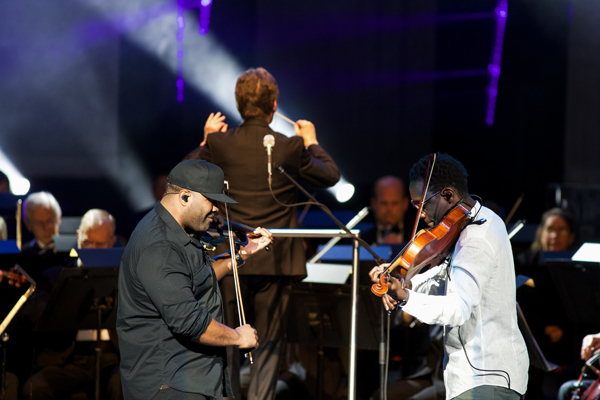 The hip-hop duo that plays string instruments joined the Grand Rapids Symphony for its 18th annual Symphony with Soul and a performance that blew the roof off of DeVos Performance Hall in more ways than one on Saturday, Feb. 16. For openers, it was a sold-out show, a first for the Grand Rapids Symphony, which launched the yearly event, under a different name, in 2002. But the lush strings of violinist Kev Marcus and violist Wil B., coupled with a driving beat of a drummer and DJ, took the concert led by Associate Conductor John Varineau in an entirely new direction. Black Violin’s “Impossible Tour” rolled into town for Symphony with Soul, which in the past has welcomed such artists as Lalah Hathaway, Take 6, Dee Dee Bridgewater and Lizz Wright to DeVos Hall. The Grand Rapids Symphony Community Chorus, directed by Duane Shields Davis, joined the orchestra for the concert that uses music to further the cause of diversity, equity and inclusion in West Michigan. Black Violin’s 2015 album, Stereotypes, topped Billboard’s Classical Crossover chart while also reaching No. 4 on the R&B chart. That’s the appeal they have, and DeVos Hall was packed with regular Grand Rapids Symphony concert-goers as well as with first-timers at a Grand Rapids Symphony concert. The stage, in fact, looked just like a rock concert with computer controlled lighting illuminating mist hovering in the air. It also sounded just like a rock concert with subwoofers sending sonic booms into the 2,400 seat auditorium. Black Violin writes and performs plenty of original songs including Stereotypes, which opened their half of the show. Their song Dirty Orchestra started very clean and very classy before turning a little bluesy, a little more rhythmic, a little more dirty. A-Flat, which includes sampled sounds, put both Kev Marcus’ violin and Wil B.’s viola in the solo spotlight. Songs such as Virtuoso just push the envelope with a driving beat. 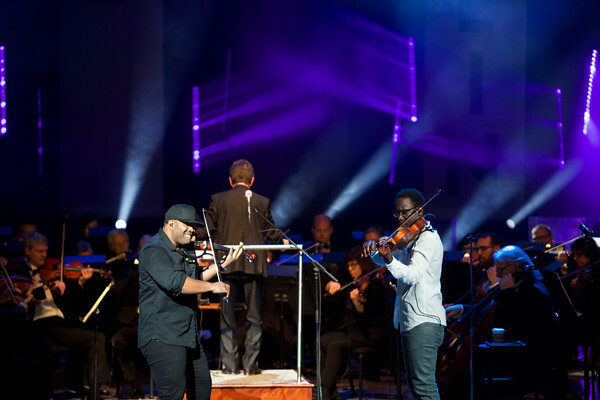 Black Violin creates a musical mashup with melodies by Mozart, Vivaldi and Bach coupled with hip-hop rhythms and electronics. Mozart Cardi opened with the Grand Rapids Symphony playing a bit of Mozart’s Symphony No. 40 as straight as can be before adding in Kev Marcus, Wil B, electronic effects and samplings from Cardi B’s Bodak Yellow. It’s hard to imagine how two distinctly different genres of music could be blended better. Davis, who has been a part of the Symphony with Soul since its beginning, composed an ambitious original work for orchestra and chorus titled Soar on Wings like Eagles. With texts from Maya Angelou and the Book of Isaiah, it shares an important message, but the music with swinging rhythms packed a wallop with gospel fervor. A highlight was a performance of Voices Shouting Out, composed in 2002 by African-American composer Nkeiru Okoye. Born in New York to a Nigerian immigrant father and an African-American woman, Okoye set out to compose a remembrance of the 9/11 Terrorist Attacks of the previous year. Rather than a work of sorrow, it evolved into a hymn of celebration, drawing on elements of classical music and hip-hop, with hints of Leonard Bernstein and traditional Yoruba music among other styles. It’s an inspiring and uplifting work, and it was given an inspiring and uplifting performance. Violinist Kevin Sylvester and violist Wilner Baptiste went to college to study classical music. Today both are professional musicians, but neither wear white tie and tails on stage. As Black Violin, “Kev Marcus” and “Wil B.” break down stereotypes and cultural barriers, one gig at a time. The classical and hip-hop crossover duo joins the Grand Rapids Symphony for its annual Symphony with Soul at 8 p.m., Saturday, February 16 in DeVos Performance Hall. 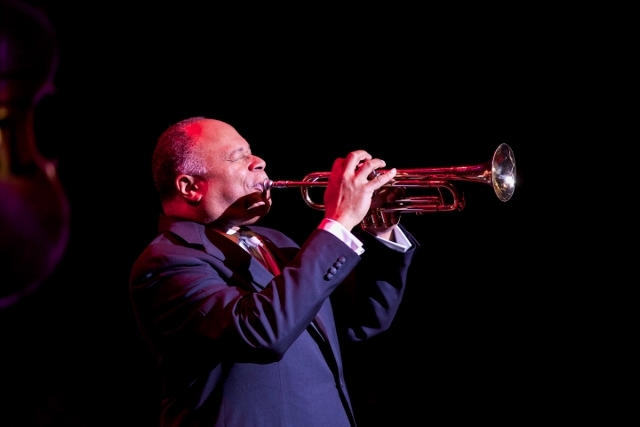 Associate Conductor John Varineau leads the Grand Rapids Symphony in the evening of gospel, spirituals, jazz, blues, and R&B, celebrating diversity and inclusion in West Michigan, featuring community musicians joins nationally renowned artists to perform for the wider community. The show is sold out, a first in the 18-year history of the Grand Rapids Symphony’s special event celebrating musical diversity, equity and inclusion. Returned tickets may be available at the door. Natives of Ft. Lauderdale, Florida, Kev Marcus and Wil B. went to separate colleges but reconnected after they returned home. Among other musical pursuits, they soon began covering hip-hop songs on their violins, something no performing artist had done before. “We approach our artistry and our craft as pop singers or rappers. That’s how we move. It’s just we have violins in our hands,” Wil B. said recently in an interview with Grandeur magazine in Grand Rapids, just prior to the show in DeVos Hall. In 2004, Black Violin was invited to appear with Alicia Keys at the Billboard Awards. The following year, two years after they first sent an audition tape to Showtime at the Apollo, they were invited to participate and promptly won the competition in 2005. Black Violin was on its way. 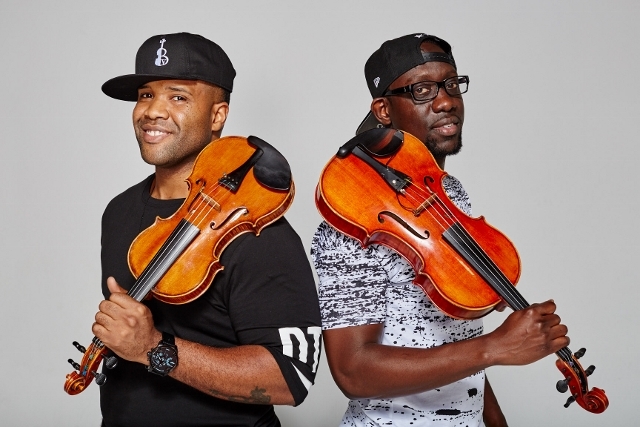 Black Violin, known for a “hard-hitting beat with lush string sounds,” has toured with Kanye West, Jay-Z and Linkin Park and has collaborated with Aerosmith, Wynton Marsalis and Elvis Costello. In January 2013, they performed for President Barack Obama at his Second Inauguration. Symphony with Soul also features the Grand Rapids Symphony Community Chorus, a vocal ensemble that sings in the gospel tradition, led by Duane Shields Davis. Performers for Symphony with Soul include young musicians from the Grand Rapids Symphony’s Mosaic Scholarship Program for talented African-American and Latinx students. The program provides teenage students with one-on-one lessons with a professional musician from the Grand Rapids Symphony plus with instrument rental, music, supplies, and tickets to Grand Rapids Symphony concerts. Opening the program is the anthem “Lift Ev’ry Voice and Sing.” First performed in 1900 by a group of 500 school children for President Lincoln’s birthday celebration, the cherished song of the Civil Rights Movement is the traditional opener for the community celebration in DeVos Hall. Each year, the Grand Rapids Symphony’s Symphony with Soul is preceded by Celebration of Soul, a gala dinner honoring the accomplishments of individuals and organizations in the community that emphasize and celebrate the importance of cultural awareness and inclusion in West Michigan. This year’s recipients of the Dr. MaLinda P. Sapp Legacy Award are architect, business owner and jazz musician Isaac V. Norris; Grand Rapids Symphony Associate Conductor John Varineau; and retired educator, photographer and musician Noel Webley II. Each are leaders in successfully advancing multiculturalism and multicultural awareness in their profession or industry and are role models of consistent, creative encouragement in the community to become more culturally competent. A limited licensed psychologist, licensed counselor and college professor, Dr. MaLinda P. Sapp was co-pastor of Lighthouse Full Life Center Church in Grand Rapids, along with her husband, gospel artist Marvin Sapp. Prior to her death in 2010, Dr. Sapp was awarded the Grand Rapids Symphony’s Celebration of Soul Legacy Award. The award was renamed posthumously in her honor. Tickets start at $18 adults, $5 students for Symphony with Soul. Call the Grand Rapids Symphony at (616) 454-9451 ext. 4 or go online to GRSymphony.org. In all of classical music, few composers are more beloved than Pyotr Ilyich Tchaikovsky. Though the bombastic 1812 Overture and the enchanting ballet The Nutcracker are some of Tchaikovsky’s best-known works, almost every note that poured from his pen remains popular with audiences. Igor Stravinsky proclaimed Tchaikovsky to be “the most Russian of all composers,” but Tchaikovsky’s music has universal appeal. So much so that the Grand Rapids Symphony performs an all-Tchaikovsky concert on Friday and Saturday, Feb. 8-9. Music Director Marcelo Lehninger leads music of Tchaikovsky with “well-known and unknown pieces” as he put it. Tchaikovsky Festival is at 8 p.m. in DeVos Performance Hall, 303 Monroe Ave. NW. “Inside the Music,” a free, pre-concert talk, begins at 7 p.m. Tickets for concerts in the Richard and Helen DeVos Classical start at $18 adults, $5 students. Call (616) 454-9451 ext. 4 or go online to GRSymphony.org. Joining Grand Rapids Symphony is cellist Andrei Ioniţă to perform Tchaikovsky’s popular Variations on a Rococo Theme for Cello and Orchestra, which the late 19th century composer paid homage to the lighter 18th century music of Mozart and Haydn. 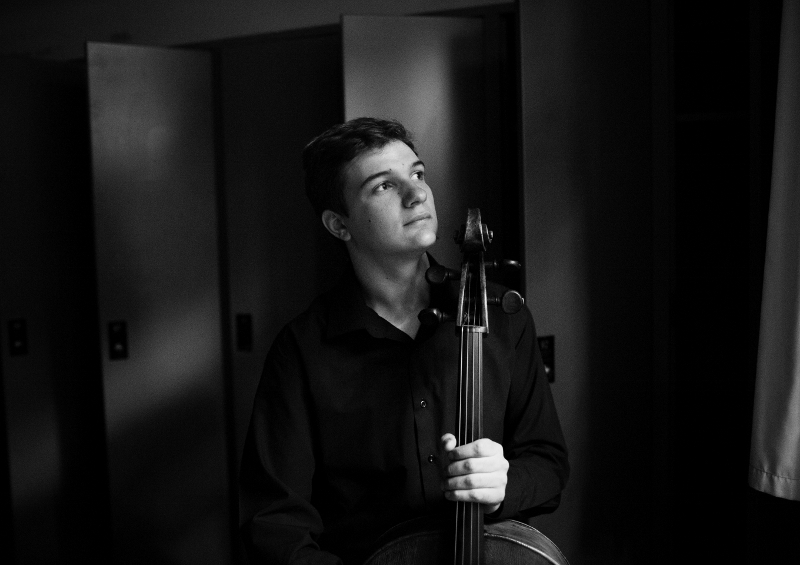 The Romanian cellist is Gold Medalist of the 2015 International Tchaikovsky Competition, one of the world’s most prestigious music competitions. “It was the most intense competition experience I’ve ever had, and I believe the other competitors would agree with me as well,” Ioniţă told the classical music blog Interlude shortly after his victory. 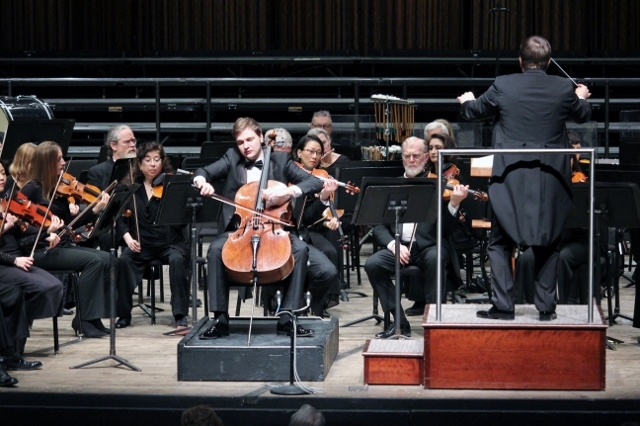 Ioniţă, who will make his Grand Rapids Symphony debut, also will perform Tchaikovsky’s Andante Cantabile for Cello and Orchestra, an arrangement of the second movement of Tchaikovsky’s String Quartet No. 1, which uses a Ukrainian folk song as one of its main themes. “He’s a wonderful young cellist,” said Lehninger, who worked pervious with the 25-year-old musician. The Grand Rapids Symphony Chorus will join the orchestra to sing a youthful, less familiar work titled “At Bedtime,” which Tchaikovsky composed during his student days. Familiar music on the program on this weekend’s concerts includes Tchaikovsky’s Symphony No. 4, which reflects the composer’s disastrous marriage that would end in divorce less than a year later. Winter definitely has arrived in Michigan, but if you were in the audience with the Grand Rapids Symphony on Friday, it was easy to forget the chilly winds and flurries headed our way. Sizzling Spanish music by Manuel de Falla and Joaquin Rodrigo and lush Latinx music by Astor Piazzolla and Alberto Ginastera filled an evening with music to warm every heart in DeVos Performance Hall on Friday, Jan. 18. In short, it was just what the doctor ordered as an antidote to January in Michigan. 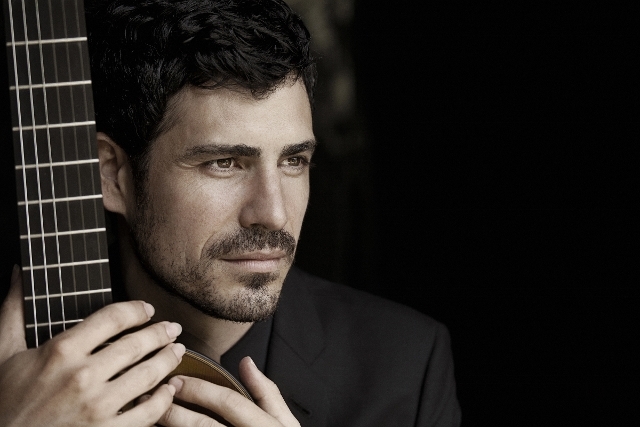 The Richard and Helen DeVos Classical series welcomed the sensational Spanish guitarist Pablo Sáinz Villegas back to the Grand Rapids Symphony’s stage. A concert titled “Rhythm of the Dance” naturally needs dancers. Members of Grand Rapids Ballet were part of the show as well. See it again at 8 p.m. Saturday, Jan. 19, in DeVos Performance Hall. Tickets for “Rhythm of the Dance,” beginning at $18 adults, $5 students, remain available. Music by Spanish and Latinx composers has played a small part in the Grand Rapids Symphony’s repertoire in its nearly 90-year history. Under Brazilian-born Music Director Marcelo Lehninger, that’s changing dramatically. 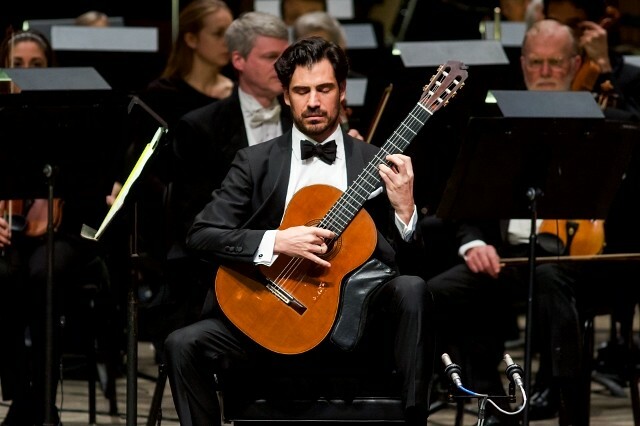 Rodrigo’s Concierto de Aranjuez is the world’s best-known, best-loved concerto for guitar and orchestra. Inspired by the gardens of the Spanish royal palace at Aranjuez, it’s full of exciting flamenco rhythms, beautiful melodies and flashy guitar solos. You just can’t listen to it without visualizing it in your mind. It’s also a thoroughly Spanish work, and hearing a Spanish guitarist bring it to life is a rare treat. Villegas is a commanding presence on stage as well as an accomplished artist who makes difficult music seem effortless while appearing to have the time of his life performing. The key to a great performance of the Concierto de Aranjuez is the guitarist has to go the extra mile, make a leap of faith, and trust that the conductor and orchestra will follow. Friday’s performance was an amazing partnership between Villegas and Lehninger that spoke to the humble origins of the guitar and to Rodrigo’s folk-flavored melodies set against the loftier canvas of a well-crafted work for a symphony orchestra. The first movement is just pure fun to listen to. The achingly beautiful second movement, featuring a gorgeous English horn solo by Kathleen Gomez, unfolded like the sun breaking through the clouds on a gray day. The third movement hummed with energy and expression. For an encore, Villegas played a waltz from his home in northern Spain that celebrates the harvest. In reality, it’s a set of variations of increasing complexity in which he plays melodies entirely on harmonics or embedded within chords while transforming his guitar into a snare drum and other percussion instruments. It was a performance that had Grand Rapids Symphony musicians craning their necks, straining to see just how the heck he was doing what he was doing. Sultry and sensuous choreography by GRB Artistic Director James Sofranko was equal to the sultry and sensuous performance led by Lehninger. Between the visual and the aural, it was guaranteed to leave pulses pounding a little faster. An absolute highlight of the evening Gabriela Frank’s Three Latin American Dances for Orchestra. A contemporary American composer of Peruvian descent, Frank’s makes masterful use of an orchestra to depict the environment. You can easily imagine yourself zip lining through the Amazon, surrounded by the sounds of falling rain, calling birds and even buzzing insects. The final movement “Mestizo’s Waltz” paid homage to the ethnic and cultural diversity of Latin America with folk-flavored music that’s familiar but which Frank elevates into a higher level of musical experience. The performance under Lehninger’s baton reveals intriguing possibilities for the future of the Grand Rapids Symphony. The program opened with Manuel de Falla’s Suite No. 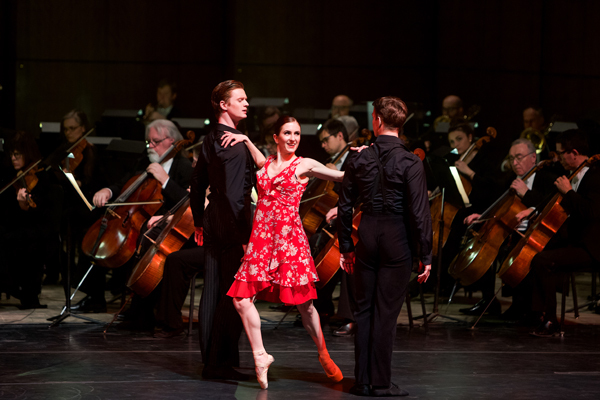 1 from his ballet “El Sombrero de tres picos” or “The Three-Cornered Hat,” a suite that the Grand Rapids Symphony appears to have only performed once previously. Lehninger led a performance that was flowing, punctuated by insistent musical gestures that were expressive and varied. It kept the orchestra on its toes and the audience as well. The evening ended with Alberto Ginastera’s Four Dances from “Estancia.” What Piazzolla was to urban life in Buenos Aires, Ginastera was to rural life in Argentina. Lehninger led a fiercely rhythmic version of “The Land Workers” and a genteel performance of “Wheat Dance” that focused on orchestral color. The payoff was the final movement, “Malambo,” a frenetic, passionate, almost obsessively driven performance that led the audience to erupt in enthusiastic applause. This fifth Classical Series concert in the Grand Rapids Symphony’s 2018-19 season would be welcome any place, at any time. But especially in the middle of a Michigan winter. A century ago, the growing city of Grand Rapids needed a symphony orchestra of its own. Several failed attempts were made to organize and sustain an orchestra. But in the final days of 1929, a newly organized Grand Rapids Symphony gave the community the gift of music for Christmas. Karl Wecker, who taught music at Grand Rapids Junior College, led the orchestra on Dec. 27 in music including Franz von Suppé’s “Poet and Peasant” Overture, the two movements of Schubert’s “Unfinished” Symphony No. 8, and Johann Strauss’ “The Blue Danube Waltz” in Central High School’s auditorium. Two weeks later, with a successful concert under its belt, the Grand Rapids Symphony Society was officially organized on Jan. 11, 1930. The Grand Rapids Symphony will celebrate its 89th birthday on stage on Friday, Jan. 11, performing the music of Haydn, Mozart and Beethoven in St. Cecilia Music Center. Today, classical music from the late 18th century remains as popular as it was more than 200 years ago. But not only is the music of Haydn, Mozart and Beethoven the heart of any orchestra’s repertoire, performing the transparent, unadorned music is fundamental to the development of any symphony orchestra. “It’s so important for an orchestra to work on the classical repertoire. Every time we perform it, the orchestra grows,” said Music Director Marcelo Lehninger. Lehninger will lead the orchestra in The Classical Concert: Viennese Masters, featuring Haydn’s Symphony No. 89, to commemorate the orchestra’s 89th season. 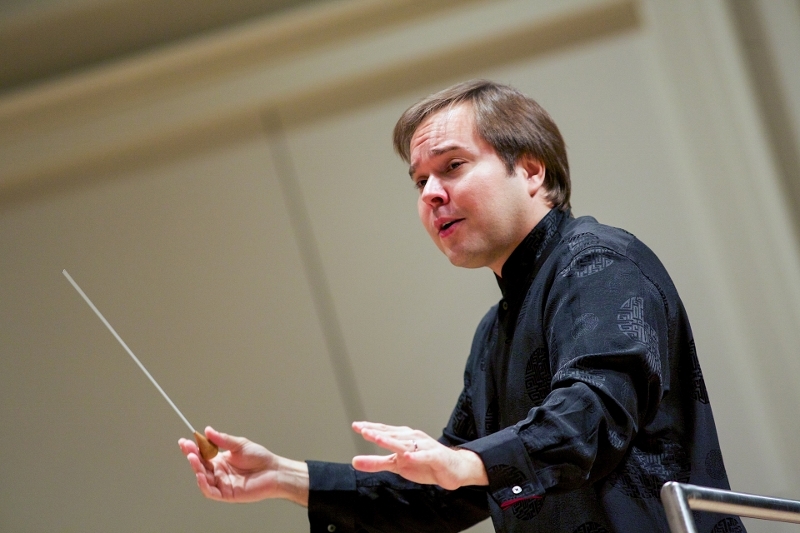 The 39-year-old conductor also will lead the Grand Rapids Symphony in Mozart’s Symphony No. 39. The PwC Great Eras series concert will open at 8 p.m. in Royce Auditorium with the overture from Beethoven’s Creatures of Prometheus. 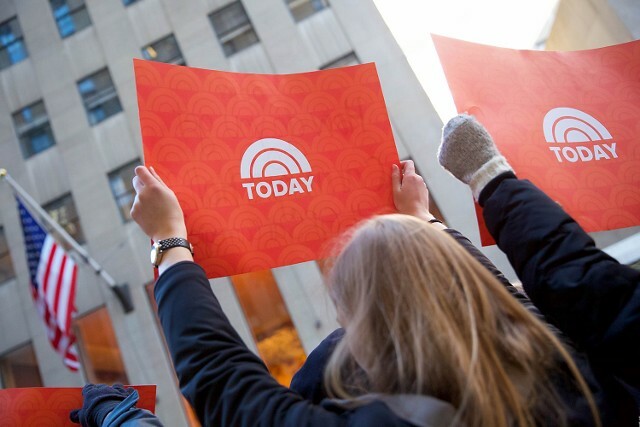 A one-hour version of the evening program will be performed earlier that day at 10 a.m. Doors open for The Classical Coffee Concert at St. Cecilia Music Center at 9 a.m. for an hour of complimentary coffee and pastries. The concert is part of the Porter Hills Coffee Classic series. Highlights of the evening concert will be given at 10 a.m. that morning The Classical Coffee Concert, part of the Porter Hills Coffee Classic series, a one-hour program held without intermission. Doors open at 9 a.m. for complementary coffee and pastry. At the end of the 18th century, continuing into the 19th century, Vienna was the music capital of Europe. It’s where Haydn, Mozart and Beethoven all lived and worked for at least part of their careers. Not surprisingly, they also all knew each other. Haydn was old enough to be Mozart’s father, but they were friends and colleagues for about seven years, occasionally playing string quartet music together, until Mozart’s untimely death in 1791 at age 35. Each admired the other’s music. Haydn declared on a number of occasions that Mozart was the greater composer of the two. Mozart, who later dedicated six string quartets to “Papa Haydn,” wrote that it was from Haydn that he had learned how to compose for string quartet. The youthful Beethoven, who studied briefly under Haydn and almost certainly met Mozart, was influenced and inspired by both masters in his early works. Though he usually isn't thought of as a composer for theater, one of the big hits of the spring season in Vienna in 1801 was Beethoven’s Creatures of Prometheus, the only full-length ballet he ever composed. As it turns out, both of the symphonies by Haydn and Mozart that are featured on this program were written almost at the same time. Haydn composed his Symphony No. 89 in 1787. Mozart completed his Symphony No. 39 months later in June 1788. WOOD TV8 has a Christmas present for Grand Rapids Symphony fans. 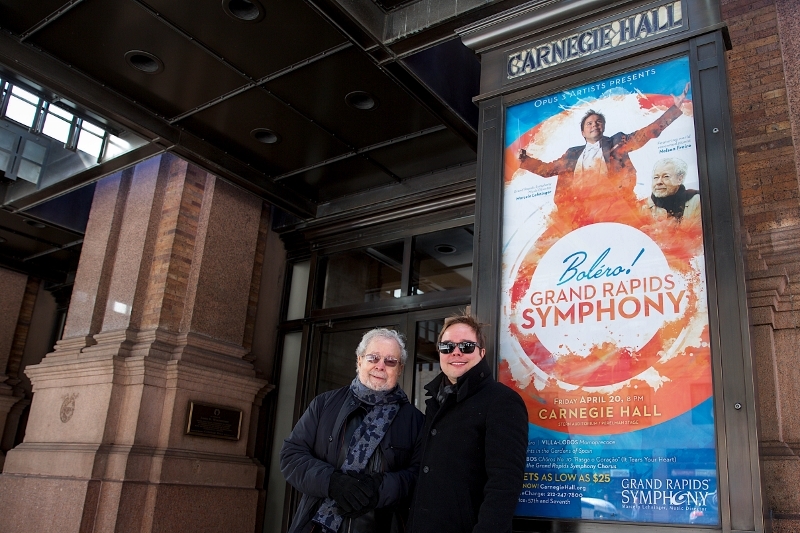 If you missed its earlier broadcasts of “Grand Rapids Symphony at Carnegie Hall,” you have a chance to see it again. The NBC-TV affiliate’s half-hour TV special airs again at 7 p.m., Wednesday, Dec. 26, on WOOD TV8. Last April, Music Director Marcelo Lehninger led the Grand Rapids Symphony and Symphony Chorus to New York City for a performance in Carnegie Hall that featured special guest pianist Nelson Freire. WOOD TV8 traveled to the Big Apple with the Grand Rapids Symphony and captured behind-the-scenes highlights for a documentary that first aired in June. It was re-broadcast a second time in early September on WXSP-TV, an affiliate of WOOD TV8. 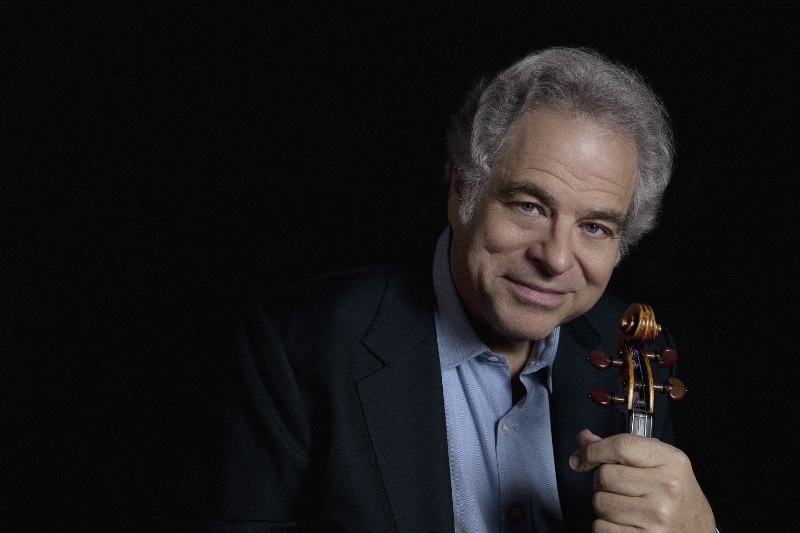 Now’s your chance to see Lehninger, who previously led the Boston Symphony Orchestra in Carnegie Hall, and Freire, who made his fifth appearance in the 127-year-old auditorium, talk about the Grand Rapids Symphony’s second appearance in the celebrated hall with music including Heitor Villa-Lobos’ Momoprecoce and Manuel de Falla’s Nights in the Gardens of Spain. 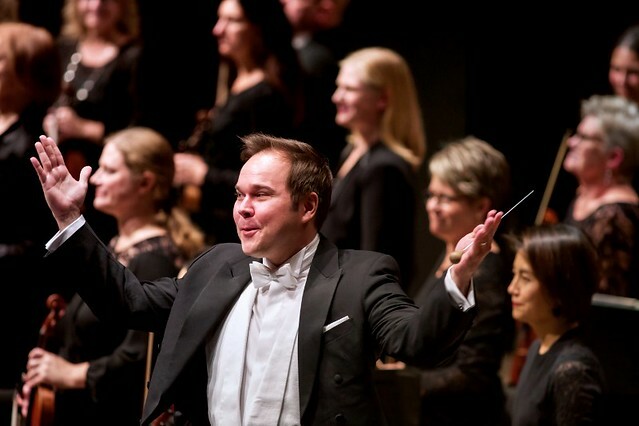 The Grand Rapids Symphony Chorus, whose director, Pearl Shangkuan, also had conducted and sung previously in Carnegie Hall, made its debut singing Heitor Villa-Lobos’ Chôros No.10 “Rasga o Coração” (It Tears your Heart). The 134-voice chorus also joined the orchestra to sing Gabriel Faure’s Pavane in F-sharp minor as an encore for the audience of over 2,300. Eva Aguirre Cooper, Community Affairs Director at WOOD TV8, accompanied the Grand Rapids Symphony to New York City for the two-day trip, taking viewers behind the scenes from rehearsals to receptions, including interviews with musicians, conductors, audience members and a brief appearance by members of the Grand Rapids Symphony Chorus on NBC-TV’s “Today Show” with Hoda Kotb. 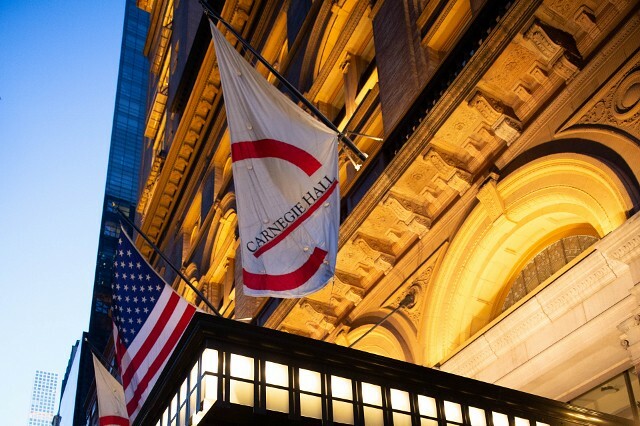 Hundreds of supporters, patrons and fans traveled from Grand Rapids to New York City for the Carnegie Hall performance on Friday, April 20. Hundreds more from the New York City area were special guests of the Grand Rapids Symphony thanks to its Symphony Scorecard program. Special guests also included Mauro Vieira, Permanent Representative of Brazil to the United Nations, and Frederico S. Duque Estrada Meyer, Deputy Permanent Representative, both based in New York City.